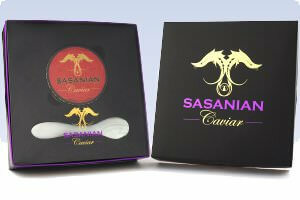 Would you like to give a small token of gourmet luxury, this Caviar Gift Box will give you that option. Select your favorite caviar, a single 1 oz. tin and we'll make sure the recipient will receive it packed together with 1 Mother of Pearl spoon. Just add this item to your shopping cart, and then ..... shop for a caviar that is available as 1 oz. You may like to add Russian or French Blini, those small pancakes which are great to serve with the caviar and your gift will be a success.